Today I have 3 random yoga related things to share with you, none of which warranted their own post, so I figured why not stick them all together in a random all things yoga post! Congratulations to Kellie from Will Run for Ears who is the winner of the 1 year class pass! And don’t forget, even if you didn’t win YogaVibes always offers a 15 day free trial if you want to check them out! 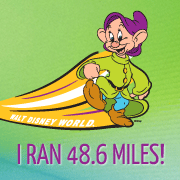 #2 – I caught my grasshopper! You may remember a few weeks ago I wrote a post about how sometimes when you step out of your comfort zone you fall on your face, like I literally did when trying a new yoga pose called grasshopper. Well today we worked on grasshopper again in class and I managed a much prettier version of it! #3 – A Yoga PSA: Clean Your Mat! To some people this may sound obvious, but I’m actually surprised at how many people I talk to who DON’T clean their yoga mat at all! If you think about it we’re always on our mat in bare feet, when we roll it up the bottom of the mat that was on the floor touches the top and then we’ll lie down and put our face right on our mat – yuck! 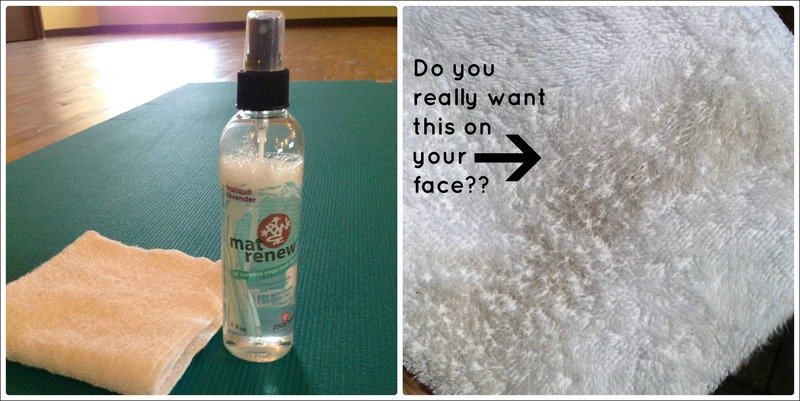 To clean your mat all you have to do is wipe it down with either a mat cleaner or just a little soap and water! (Just make sure to wipe all of soap off so it’s not slippery next time you use it!) Ready for something gross? Here’s what the washcloth looked like after I wiped down my mat today (and keep in mind I do this weekly, so imagine if you never clean your mat!). I’ve also read that some mats can be thrown right in the washing machine on a gentle cycle (however check and see if this is recommended for your specific mat, I know it’s not for mine) and then hung to dry (just don’t throw it in the dryer, that’ll ruin it for sure!). Well, there you have it, 3 random yoga related things! Happy Tuesday and Namaste my friends! WOW that pose is SICK! I’m so impressed 🙂 I’m still a total yoga newbie, but I’m trying to do it more regularly for staying loose. Thanks Christine! I’m glad I got someone to take a picture so I could see what I look like doing it, it was definitely a challenging pose! Firstly, you look AWESOME in that pose, strong lady!! Secondly, I have never cleaned my mat (yet I diligently clean all mats and equipment when I am at the gym). Why did I not think about this!! Genius!! When I first started doing yoga I never thought about cleaning my mat either. I think because it’s our personal mat (as opposed to at the gym) we just assume it’s clean…kinda gross what comes off of it thought when you wipe it down (and when you think about putting your face on your mat!). Wow!!!! I am in awe of your yoga pose!!!! Congrats on the new yoga pose! I keep thinking I want to get into yoga but haven’t had the guts to try it yet. Thanks Sarah! I’m happy to help you find some beginner resources when you’re ready to give it a try, just let me know! Thanks for reminding me to clean my mat! Actually just took it out to Dodger Stadium to stretch after the race and it has a bunch of dirt on it…. I love learning new arm balances! I think I need a bit of a break though, my arms are actually sore from working on that grasshopper! Honest? When I first started yoga, I didn’t realize you needed to clean your mat either. I don’t know why it’s not an automatic duh. Although, especially now that I commute through the city with one, it’s always being washed. My eye is on the Lulu towel mat. Looks amazing! Yeah, I don’t think I cleaned my mat that often when I started either, but I also wasn’t using it as much…now I’m shocked at what comes off it every time I clean it! I’d love to hear what you think of the towel mat if you get one…I was thinking about getting one for travel but wasn’t sure how well it would work. That’s crazy awesome! I’m working on my own “grasshopper”. Trying to finally get up to the nose of the surfboard. I am still dying to try surfing! I’d recommend not dying first! Yay! I’m so excited! And OMG congrats on the pose! That’s phenomenal! I’m just in total awe.